A little-known secret to defect-free rod coating is often directly linked to the pre-coat flood volume before the rod. Metering rod coating is essentially removing excess coating by doctoring off the surplus. Whether using an applicator roll, spray, fountain, dip tank, or slot die, controlling the pre-coat volume before the metering rod is essential and often overlooked or neglected over time. Too often in rod coating users turn to mechanical and/or chemical Band-Aids, when what is actually required is to monitor, minimize and control the pre-coat flood volume before the rod. Consider this: How much are you asking of the rod to remove: 200%, 400%, 600% perhaps 1000% of target volume? Who controls this? Who decides what’s best? Customers often ask about ideal pre-coat volume. The answer is not always uniform for all coating applications. We customarily suggest a good starting point of 400% pre-coat flood over final rod volume, though this is just a starting point and converters often need to adjust up or down to meet their application specific coating operation. Why is pre-coat flood volume important? If the coating is shear sensitive, varying degrees of viscosity can hinder efforts. Viscosity that’s too high risks failure to wet out before the coating dries. The problem is often exacerbated when coating onto non-absorbent substrates such as films and foils, which are unforgiving and often reveal apparent defects. Keeping the rod from hydroplaning is essential to maintaining control throughout the rod coating application. This is more apparent in high viscosity >600cps. If the rod rises from the substrate, the rod ceases to be volumetric and becomes hydrodynamic. When this occurs, the ability to change rods and forecast incremental increases or decreases based on thread size fails. 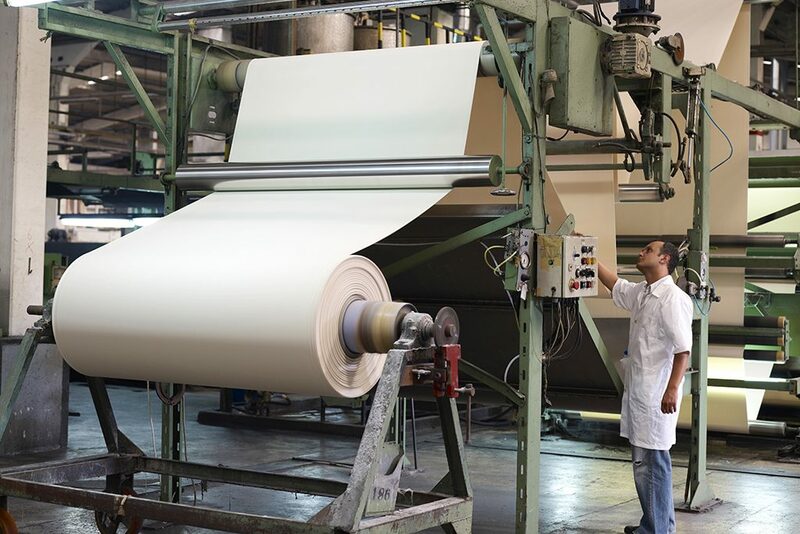 Applying a narrow volume pre-coat flood range increases control and decreases the “corduroy” effect, which is a harmonic frequency effect found more so in lightweight films. It is patternistic and can traverse 4-10 threads or wires. The problem is often misunderstood and many users turn to dual rods to eliminate the corduroy pattern. However, in our experience, when the pre-coat volume is minimized, the harmonic corduroy pattern often is eliminated. If instrumentation controls to pre-coat flood are limited, visually inspect the run off. 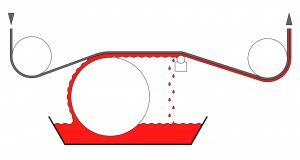 In most applications, the desired run off is similar to a heavy rain or drizzle effect. If the coating coming off the rod looks like a solid curtain (think Niagara Falls) without a break, you may be expecting too much of the rod. Once you have located the ideal narrow range for the pre-coat flood volume write it into your operational methods sheets to keep the application within that range. Buschman has helped many of our customers identify, locate, and adapt to the range that is right for a particular application. We also have engineered a variety of customer-specific threaded rods to optimize customer-specific rod applications. We can help you run an engineering experiment on your rod coater to determine the best pre-coat flood range for your application. To minimize potential problems, pursue methods to control the pre-coat flood before the rod. You’ll be glad you did.